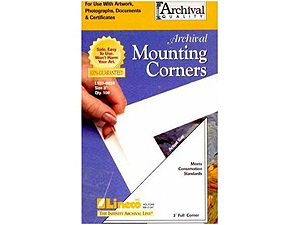 Lineco Self-Adhesive Polypropylene Mounting Framers Corners will mount light to heavy weight prints, photographs and documents without the adhesives ever coming in contact with the artwork. This full view variety minimizes the border required to hide the corner under the window mat. When used correctly, they provide adequate support, and allow for the expansion and contraction of the art within the frame. Artwork can always be removed in its original, pristine condition.